So far, most of the world has only seen the Essential Phone in static images. There are no video previews, hands-ons, or reviews of Android creator Andy Rubin's peculiar smartphone. The best we've got to work with for now is a newly published Snapchat video that's only 10 seconds long, but is entertaining nevertheless. Taken in public transit, the paparazzi video shows someone using a prototype Essential Phone. WhatsApp and the notification drawer are being used and clearly visible. The prototype phone looks exactly like the final unit up front, so this is as close as seeing the real thing being taken out for a spin as it gets. The Essential will be sold exclusively by Sprint in the U.S., though it will also be available for purchase unlocked from the company's website. Shipments are expected to start in the late summer. The smartphone costs $699 on its official website. It is powered by Qualcomm's top processor, the Snapdragon 835, alongside 4GB RAM and a dual camera setup. The phone runs a modification of Android that's ready to be integrated into a future smart home ecosystem. Read more about the innovative Essential phone in the links below the video. May 31, 2017, 9:24 AM, by Kaloyan C.
I think in a black bezel, it might not look so bad. True, but then what's the point of it being "bezel-less" at the top? Right? If you're going to make a thick notification bar to fill the space in most apps, it means that only your home screen will utilize that space, and that's a miss in my book. I'll hold off judgment to see what they do with it once it's a release ready device. LOLOLOL I know right, what a joke! What on Earth was Andy Rubbin thinking? This phone is turning into a massive disappointment, definitely not worth the flagship price essential are asking. Its not like Essential is going to read your spam and decide to reduce the price to 400$. Has nothing to do with me, when people state things not being worth the value they are being sold for, is a comparison of what's available in the same price range. Essential has no background, no storefront, no physical presence for warranty piece of mind etc and on top of that it's ultra ugly. There is no guarantee of this company staying alive for more than a year. However for that flagship price you can get a LG/Moto/Samsung/HTC from actual physical stores which offer the convenience of retuning a faulty unit immediately and not to mention said companies have been around for a decent amount of time, they won't just disappear leaving you in the dust with a 650 dollar paperweight. Also I knew full well essential wouldn't react to my comment, I didn't intent it for that, this is just a comment for a comments section on a website with enthusiasts. Better luck next time trying to burn someone, maybe actually understand the environment before tying to troll someone. and why haven't you got yourself a LG/Moto/Samsung/HTC yet ? Stock Android. I've had HTC, LG and Moto, as well as other OEM'S in the past. The horrid skins are a venom and insult to Android. Never again. Moto is stock Android, but please point me to the latest snapdragon 835 barring Moto... Wait that's right, it's not out yet. So there, any other enquiries? So you talk about how much of great deal HTC, LG, Moto is and you don't even own them. Lol. Bet you are one those one plus type guys wanting a 12gb ram phone for 300$. 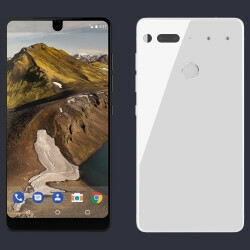 Here you have a Essential phone with stock android and promise of monthly updates, a bezel less screen far more compact than S8 without crazy ratios of S8/LG making it the only proper bezel less phone, s835 chipset, dual 13mp rear camera, 4k selfie camera, stereo speakers, Bluetooth 5, wireless charging, 128gb memory base model, and in addition a modular feature with a 360camera for a price of 699/749$. (99.9% of population does not swim with their phones and so IP ratings are not a deal breaker.) And who told you the phone does not offer warranty ? It does. As for outlets, then get over it people buy even grocery online. Its 2017.
its a phone as small s7 despite all the spec included. This phone is no longer relevant as it's a Sprint exclusive. Too bad, I would have loved to see how it performed on an open market. Oh well. Actually you can buy it unlocked from Essential and use it on any network, Sprint is only exclusive among carriers. Meh, it's still hoops that you have to jump through to get it though, it's the same with the Google Pixel. I would have loved to see how well that phone did being offered by all carriers. Well if they managed to copy a bezel-less design then that by itself is a huge success. Because manufacturing a display like that and bezel-less design isn't an easy thing. Most clones will just feature a normal LCD display with black bars all around. So your statement doesn't seem true. Maybe by an American company. Samsung also copied Xiaomi's curved screen which Samsung calls "Edge". I found it interesting. They tried something else than exist on the market. Far to be a disappointment.. especially massive! :)) some people are hilarious.. if you don't like it means you are not the target.. life so simple.. if you want! Actually something like this has already been in the market since September 2016. It's called the Xiaomi Mix. Why TF is this guy having to touch at the top of the screen so much? That's ridiculous. Who designed this s**t ? Wtf . They think ppl would buy this s**t ? What did they think . It doesn't look to bad, though. The lack of 3.5mm jack is what kills it for me. Looks bigger than suggested. So far from the image, looks decent. Wow, this phone is really disappointing. I can't believe the co-founder of android copied this design from Xiaomi and then butchered it. At least they improved on the screen resolution and camera. But I think I'll hold out for the Xiaomi Mix 2.